Over one million tourists visit Bethlehem yearly, including virtually every Christian tourist to Israel. In fact, for Christian tourism to Israel, Jerusalem and Bethlehem are a tour couplet, and for any tourist, the town holds intriguing history, shops, and eateries. Bethlehem is first referenced in the Hebrew Scriptures, and known primarily as Rachel’s burial place and King David’s city of origin. Since the spread of Christianity, Bethlehem is most famous as Jesus’s birthplace, and it is the consequent Christian tourism which largely supports this small town of around 25,000. When you visit Bethlehem, you’ll feel it is very welcoming for tourists. The people are genuinely friendly, and the prices friendly to your wallet – lower than in neighboring Israel. At the same time, it’s good to know beforehand that aesthetically speaking, Bethlehem is not necessarily what tourists might expect of Jesus’s birth place, as it is not a fully Western developed area. Bethlehem’s main attraction are the Christian religious sites. While you’re here, you can take advantage of the myriad souvenir shops and restaurants as well. The biggest tourist pilgrimages to Bethlehem are during Christmas and Easter times. In addition, there are some specific Greek Orthodox holidays celebrated. Christians celebrate Jesus’ birthday on Christmas. The dates can differ – December 25th for Catholics and and Protestants; most Orthodox denominations on January 6th; and Armenian Orthodox on January 19th. Aside from Jesus’ birth, the other main facet celebrated was his believed resurrection after his crucifixion. The dates differ each year, and also depend on denomination. While Christmas brings in the most tourists, Easter also has its share. The Greek Orthodox have particular traditions which they celebrate near Bethlehem. On May 5-6, the Greek Orthodox hold the Feast of Saint George (al-Khadr) festival, during which time the locals trek to baptize newborns and sacrifice sheep around the nearby Monastery of St. George. in the town of al-Khader. Another local Greek Orthodox holiday is the Feast of St. Elijah, commemorated by a foot march to the Mar Elias Monastery, north of Bethlehem. Many tourists prefer to go with an organized tour to Bethlehem from Jerusalem. If you prefer to travel individually, you can easily get there from Jerusalem via bus or cab. However you travel to Bethlehem from Jerusalem, you’ll enjoy the view of the Judean Hills, and for a point of discussion along the way, you might catch a glimpse of the graffiti art on the Security Wall. Be sure to dress modestly for holy sites, i.e. pants for men, skirts/dresses for women (can be wrap-around), and arms covered. The main attractions in Bethlehem are the Church of the Nativity, and the Shepherd’s Square and Grotto. In addition, just outside Bethlehem is Rachel’s Tomb. Below are descriptions of these sites. The Church of the Nativity (or Basilica of the Nativity), the main tourist attraction, is a simple church built atop the Holy Crypt, a cave where tradition holds Jesus was born. While the church’s interior structures include candelabras, stained glass, and staunch columns, before you visit, bear in mind that it is no cathedral. The Church of the Nativity stands prominently as Bethlehem’s city center, introduced by the renowned Manger Square plaza. If you wish to light candles in the Church of the Nativity, you can purchase them via vendors in Manger Square. Nearby sites include the Milk Grotto, where Mary is said to have nursed Jesus when the family fled Bethlehem, and Shepherd’s Fields, a rotunda-topped, round building established in tribute to the shepherds who left their fold to follow Jesus. Just before Bethlehem proper lies Rachel’s Tomb. The site is sacred as it is considered the burial place of the Jewish foremother, Rachel. The area was recently well renovated, and is easily accessible via a direct Egged bus from the Jerusalem Central Bus Station. For Jews, the site is one of prayer for achieving one’s hopes, such as marriage and fertility. In addition to the religious draw for the city, there are many local shops and restaurants. In fact, the shopping and eating are often fused since restaurants and shops have a tendency to share adjoining space. On the main streets around Manger Square, as well as side streets, you’ll find several souvenir shops – often the same as you’d find on Ben Yehuda Street in Jerusalem – just cheaper. Bethlehem is famous for olivewood crafts, and jewelry (make sure it’s certified). For eats, Bethlehem restaurants offer a range of mostly middle eastern fare, with recipes dating back perhaps hundreds of years. For local food, a popular restaurant is right at your fingertips in Manger Square – the Bethlehem Peace Centre Restaurant, offering both traditional Palestinian, as well as Western-influenced dishes. If you’re up for non-middle-eastern, you can try the Milano pizza restaurant, on Jerusalem-Hebron Street, which has a large following, or the Stars and Bucks café (yes, that’s its name) on Nativity Street, for hot drinks a Westerner will recognize, with the added menu item of a nargila smoke. If you would like to stay on for more than a day trip, there are several Bethlehem hotels and hostels, each type ranging from higher-end to low-budget. 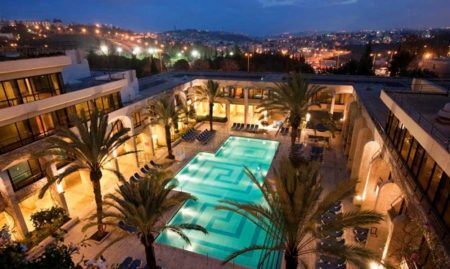 Top Bethlehem hotels include the 5-star Jacir Palace Intercontinental Hotel, the 4-star Paradise Hotel, and the 3-star Shepherd’s House Hotel. Bethlehem hostels can be a good choice for both reasonable accommodation and prices. Top hostels in Bethlehem include the well-known Bethlehem Youth Hostel on Anatreh Street, the House of Peace Guest House on Wad Ma’ali Saff St., and the Sweet Dreams Hostel on Manger Square.